P.J’s spooky & Spiritual Blog! Where you can find me! If you enjoy historical fiction with a great plot this is the book for you. The supernatural element of the tale gives it another dimension (no pun intended). The author skillfully moves between the past and the present which you may think would be confusing but in fact is not at all, each ghostly revelation builds up the layers of the story and adds to the tension. This is one of those books which you don’t want to put down and you find yourself totally immersed in. It is not only supernatural forces which threaten the heroine, the author’s depiction of the predatory estate agent is well drawn, chilling and disturbing. A thoroughly enjoyable read which would make an excellent film. This was launched by LULU – I wanted to be clever and use an image that hinted on the story and once read, the reader would understand the image. Also as the book is about acceptance, I hoped the book would be judged on its own merits and not its cover – I was wrong – although saying that I was extremely shy and not confident in my abilities as an author and held a book launch party without any books!!!! The characters and relationships develop constantly throughout the book. Constant surprises and mystery keep you glued to the pages right to the end where everything falls into place. Can’t wait to read her next book! This was the next book I launched at Theatre Clwyd a few years later, taking away the ‘Ruined’ part of the title and leaving it as ‘Echoes’, which worked better for me and I believe the story. Looking back on this I should never have added the blue, but lessons learned! That said, it was this version that won the best e-book category in the Paris book awards in 2013 and was awarded an Honorable mention in the New England book festival 2012 only months after launching – so judges judged the book on its story – not the cover!! I was blown away, the characters in the book are described so well, you can feel all their emotions, the plot twists and turns, the anticipation of what will happen next. And its not what I thought would ! A really good read, I know its an old saying but I could not put the book down (well the kindle) The research has been done so well, you can feel yourself there. In my view an excellent book with a great story, well researched and well written. I decided to try a cover with a bit more information and this was the result! I thank a man called Alex who helped me and although when I compare this cover to others it is not the best, many readers got in touch and told me they really liked it, finding it ‘spooky’! It was this version that was awarded an Honorable mention in the London book festival – so can’t all be bad! There are very few books that last past the first 10 minutes in bed, at night, before I fall asleep. For several evenings I dashed home from work, threw some food together for the family and on one occasion sat up until 2am to finish the book. 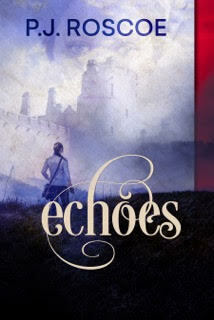 ‘Echoes’ was re-launched on the 24th November 2014 by Christine F Anderson publishing. After a couple of false starts, we decided on this cover as it portrays the castle nicely and the eyes draw the reader in. They are NOT my eyes, although strangely, my eye colour is the same – almost! I couldn’t put this book down until I had read it. Everything was put on hold until it was finished. PJ Roscoe certainly knows how to spin a yarn. It was done by a talented lady – Alison Jones who kindly helped me portray ‘Echoes’ in another light.